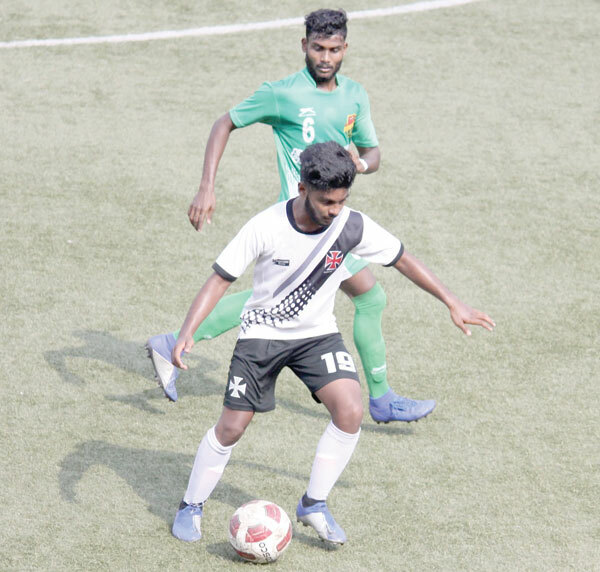 MAPUSA: Riding on Stephen Satarkar’s hat-trick, Salgaocar Football Club registered a fluent 4-1 win over Vasco Sports Club in the Goa Professional League organized by GFA, at Duler stadium, here, on Tuesday. Before the start of the match, one-minute silence was observed for the departed soul of Manohar Parrikar. With Tuesday’s win, Salgaocar FC moved to 35 points from 16 matches while Vasco SC stayed on 27 points from 21 matches. Salgaocar led 1-0 at half time through Ronaldo Oliveira. Crossing ends, Stephen Satarkar stole the limelight with a hat-trick. Moises D’Sa was the lone scorer for Port Towners. Vasco were on the front foot and almost punished Salgaocar in the fifth minute when a mis-communication between keeper Jason D`Mello and defender Saurabh Patel saw the ball roll to Shubham Dessai who to everyone’s astonishment saw his lob go over the crossbar. Salgaocar’s Devendra Murgaonkar was unlucky not to see his team go ahead when his ferocious 25-yard shot hit the top post. While at the other end, Rugved Yeole could not keep his strike goal wards for Vasco after being found by Nigerian Penn Orji. In the 33rd minute, Salgaocar keeper Jason brought a superlative save to stop Shubham Dessai’s shot from close range fromcreeping into the net. Ronaldo Oliveria finally got Salgaocar the much needed goal in the 42nd minute with a rasping right footer which had no answer from the Vasco custodian. On resumption of second half, Salgoacar showed more urgency and almost doubled their lead in the 50th minute but Devendra Murgaonkar’s header from an inch perfect cross delivered by Godfrey Mascarenhas was tipped over the bar by keeper Sanju. Stephen Satarkar made it 2-0 in the 52nd minute for the Green Brigade with a clever dink over the keeper after Godfrey provided the cross in the danger box from the right side. Vasco were finding it difficult to keep up to the pace of their opponents who did not waste time in making it 3-0 through Stephen Satarkar who fired the ball into the net after being found by Chaitan Komarpant. Stephen Satarkar got his hat-trick and eventually settled the match for Salgaocar three minute later with a cracking right footer with Ronaldo providing the cross to make it 4-0. It was not Devendra`s day as he was once again denied by the sharpness of keeper Sanju in a one-to-one situation. The Port Towners managed to get a consolation goal in the closing stages through Moises D’Sa who beat keeper Jason with a neat placement from a cross delivered by Rugved Yeole to make it 4-1.